Pies have been around for a long time. According to food history, the first pies, a thin pancake wrapped around honey, appeared in Egypt around 9500BC. “Pyes”, as a food item, were referenced as early as the 12th century in England. 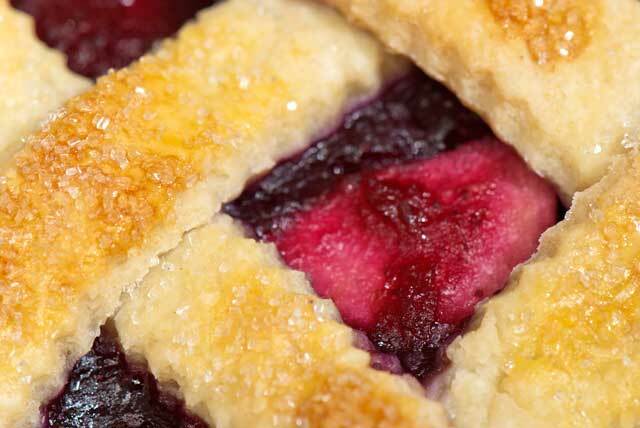 Pies are defined as pastry dough covering a sweet or savory filling. My family loves pies. My daughter’s favorite is my chocolate cream pie and my husband’s favorite is pecan pie. I don’t know if I can pick a favorite; but fruit pies are high on my list. Recently, I purchased the cookbook What Katie Ate by Katie Quinn Davies, a food blogger. The cover photo grabbed my eye. 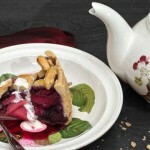 The beautiful image is an Apple, ginger and blueberry short crust pie. When I offered to bring dessert to a dinner party, this recipe was what I wanted to bake. Gather the ingredients for the pastry. Sift together the flours and the salt. Add the butter cubes to the flour and mix together with a pastry blender or your fingertips. 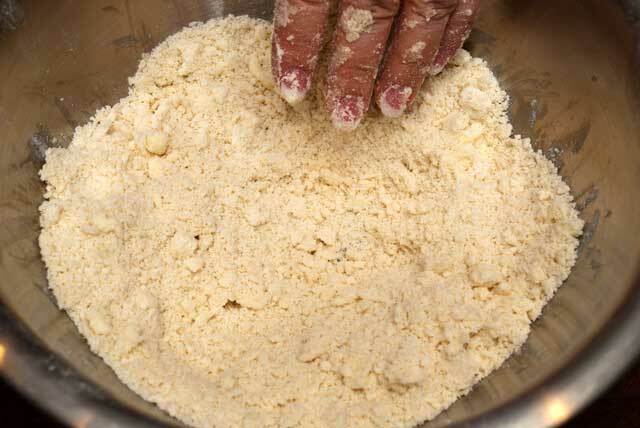 Blend the butter with the flour until the mixture resembles cornmeal. Add ice water, one tablespoon at a time, until the mixture forms a ball. Gather the dough together into a disk and wrap it in plastic wrap. Chill for at least one hour. 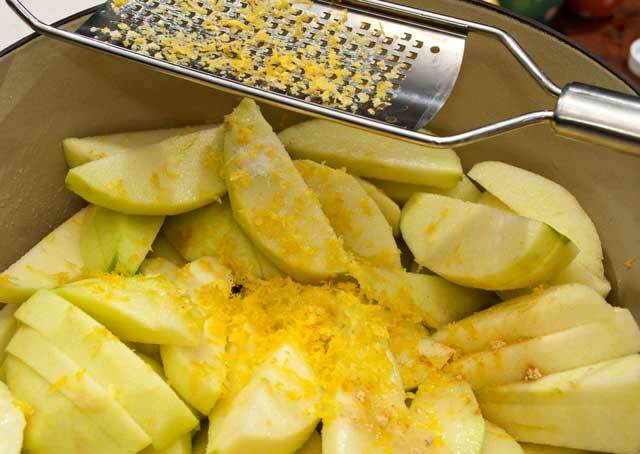 Peel, core and cut 4 large apples into ½” slices. Put them into a medium sized pan and add 1 cup of water, the sugar, the ginger and the lemon zest. Bring to a boil, and then simmer until the apples are soft. Add 1 cup of fresh blueberries to the pan and cook for another 5 minutes. Turn off the heat and let the mixture cool. When cool, strain off the liquid into a separate pan. In another pan, put the remaining 2 cups of blueberries ¼ cup of water and ¼ cup of sugar. Cook over high heat just until the berries start to pop. Pour off half the liquid into the other strained syrup. Meanwhile, mix together 1 tablespoon of cornstarch and 2 tablespoons of water. 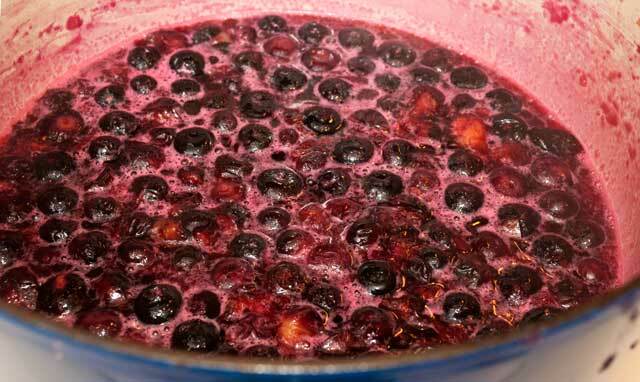 Gradually add this mixture into the blueberries just until the syrup starts to thicken. 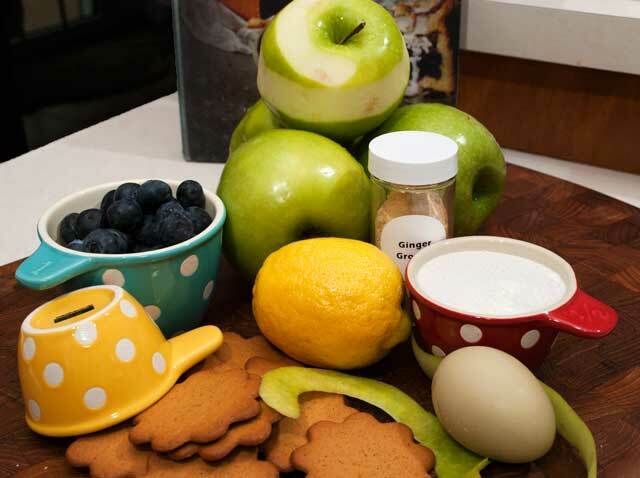 Stir the remaining apple slices, from the fifth apple, into the blueberry mixture. Cool then add to the previously cooked apple mixture. Butter the bottom and sides of a 9” springform pan. Roll out 2/3 of the dough to ¼” thick. Place it on the bottom and up the sides of the springform pan. Put a sheet of parchment paper over the dough. On top of the parchment, place an 8” cake pan. Blind bake for 10-15 minutes, until the crust is lightly golden. 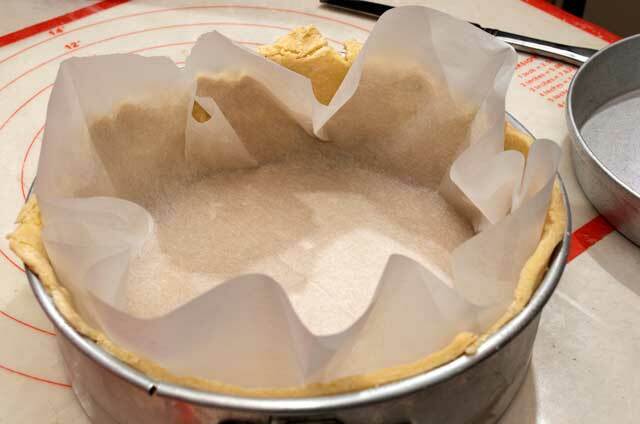 Remove the parchment and the cake pan and let the crust cool. Sprinkle on the crushed ginger cookies. Add the apple blueberry mixture. With the remaining dough, roll it out to ¼” thick. Cut 8-10 ½” strips. Lay 4 or 5 strips on top of the fruit mixture. Weave in the remaining 4-5 strips to create a crisscross pattern. Pinch the strips to the edge of the pie crust. Brush the pastry with beaten egg. Sprinkle sanding sugar over the pastry. 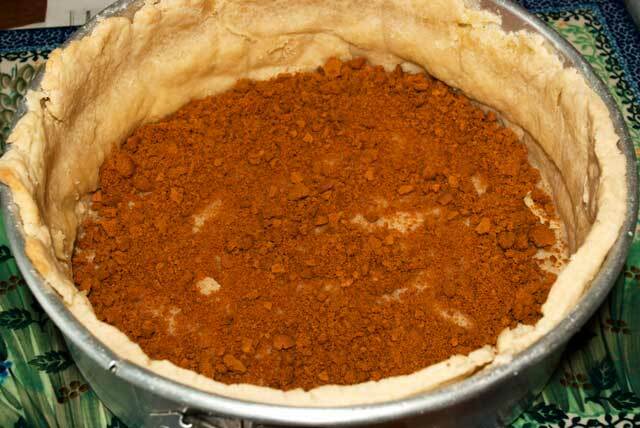 Bake the pie for 50 minutes or until the pastry is lightly golden and the filling is bubbling. Cool until the pastry starts to pull away from the sides of the pan. Release the springform ring. 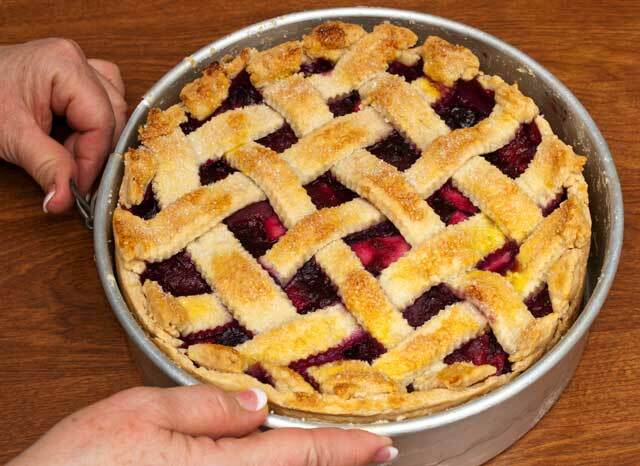 While the pie is baking, boil the syrup that was drained from the fruit until it is reduced by half. Set aside to cool. Serve the pie with the syrup and a drizzle of heavy cream. The top of the pie was golden and glistened with sugar. 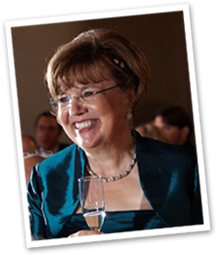 All the guests at the dinner party loved the pie! Gather the ingredients for the pastry. Sift together the flours and the salt. 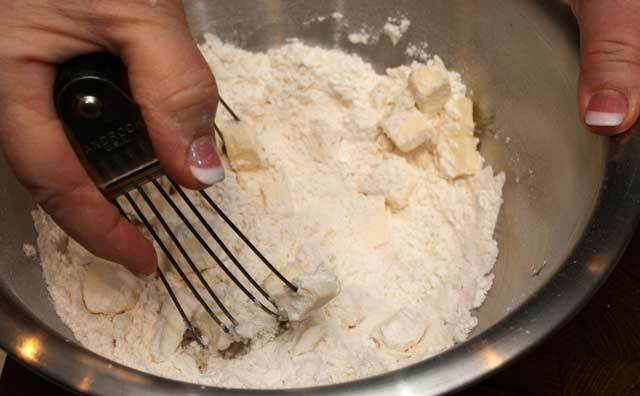 Add the butter cubes to the flour and mix together with a pastry blender or your fingertips. 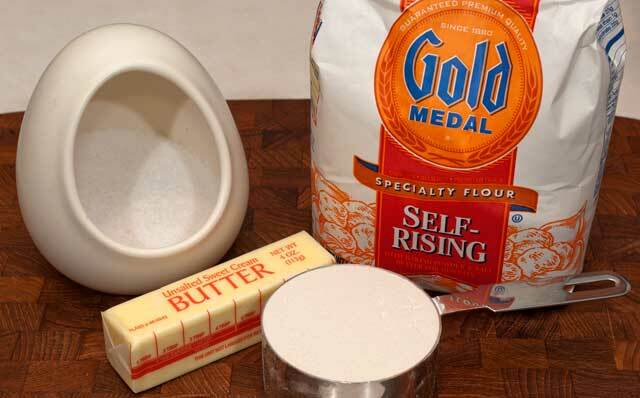 Blend the butter with the flour until the mixture resembles cornmeal. Sprinkle on the crushed ginger cookies. Add the apple blueberry mixture. 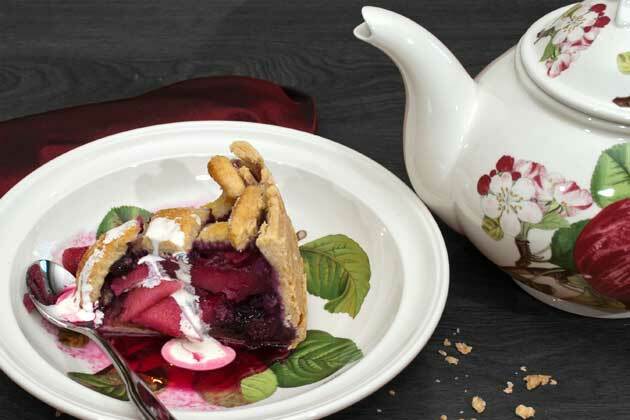 Serve the pie with the reduced syrup and a drizzle of heavy cream. 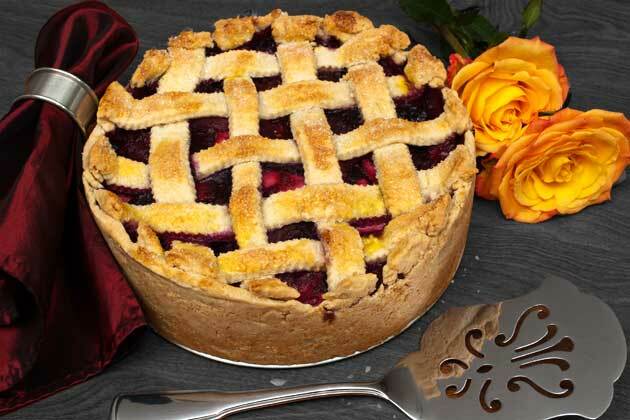 After the dinner party where my wife brought this pie, I committed a social faux pas – I took the leftover pie home. She told me that you’re supposed to leave the leftovers for your host to enjoy. I knew I was doing something bad. But, the pie was that good. We had what was left for breakfast the next day. My mom would not have approved eating desert for breakfast when I was a kid. But when you’re an adult, you are allowed to eat desert anytime you want.